The Peculiars by Maureen Doyle McQuerry. Publication : May 1st 2012 by Amulet Books. The Peculiars follows the story of Lena Mattacascar who is part Goblin. When Lena turns eighteen, she receives a letter, along a few other things, from her father who abandoned her years ago. Hell-bent on learning more about him and her heritage, Lena sets out to Knob Knoster, a town close to Scree, in search of answers. Along the way, she encounters various people and adventures that side-track her journey. Well, I should begin with this - this book isn't dark, not really, so the blurb is slightly misleading. I wish it took a darker turn. Having said that, McQuerry has a way with world-building, she's definitely creative with it. Reading about a protagonist who's part Goblin was a breath of fresh air after all the books I've been reading lately but having raised my expectations so much in the beginning, the novel fell short in the middle. The Peculiars is one of those novels with the dreaded mid-book slump. However, right when I was about to give up all hope, the story got interesting and picked up its pace again towards the end. Lena wasn't exactly one of my favorite leads and the same goes for Jimson. While some may find their romance sweet/cute, I found it tad boring. I guess character-development may not be the book's strength but Lena did redeem herself as the book progressed, letting go of her insecurities and standing up for herself. Although I wished the novel took a different direction, McQuerry's writing made me stick through the entire book as she managed to keep it interesting. She paints a vivid picture and it's hard to not appreciate that in a book. 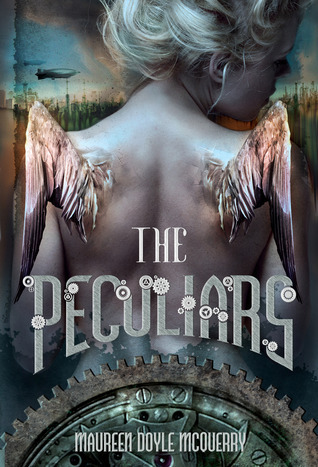 Let me put it this way, if you're new to the Steampunk genre, you might really enjoy The Peculiars. On the other hand, I'm not new to it. I like steampunk novels and I went in expecting a lot from this book and I'm not saying that it wasn't good, just that it could've been better. I'm torn between rating this book 2 or 3 stars but I'm deciding on 3 for the author's writing, imagination and unique idea alone. Nice review. I also read & reviewed an ARC of the Peculiars and had the same reaction to it & agree with most of your points. Nice review! I attempted to read an ARC of this, but I couldn't even get half way through it. It just wasn't for me - but I'm glad that you enjoyed it. I loved the creativity and the fun of this book. The story and characters will leave you thinking about The Peculiars long after finishing the book. The cover is amazing and made me want to read it despite the lack luster blurb. You've got to read this one! It's a great ride!